The hosts come into this match on the back of a three-game losing streak. You would maybe feel that a home game is the ideal way to get back to winning ways but now when you come up against a side that carries a 9-1 record for the season so far. 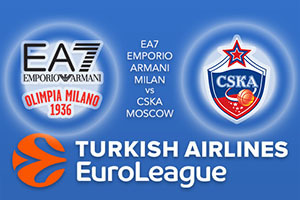 Milan know that they are in for a tough evening in the Euroleague when CSKA Moscow come to town. With a 4-6 record overall, and a 3-2 record at home, Milan haven’t been too bad so far this season but their recent form has been a disappointment. They have had some joy this season but are currently toiling and tonight’s game is unlikely to provide them with any confidence pre-match. The hosts can score though, they are averaging 90.4 points at home this season and if they can hit that sort of form, they’ll have a chance. Rakim Sander has picked up an average of 14.1 points per game, Ricky Hickman has delivered an average of 10.7 points per game and Kruno Simon has given the hosts an average of 10.1 points per game so far this campaign. The league leaders have won in their last three games and they look set to remain out in front this week. While the loss of Nando De Colo, a player with an average of 21 points per game, has been felt, other players have stepped up. The Euroleague MVP has been reintroduced to the squad and could even feature in Milan, which will no doubt cause the home team some concern. However, Moscow aren’t a one-man team as the form of Milos Teodosic, with an average of 18.7 points per game indicates. There has also been support from Cory Higgins, with an average of 9.4 points per game and Aaron Jackson, who has provided an average of 8.7 points per game. Milan will battle hard but take CSKA Moscow at -3.5, which is provided at odds of 1.90. For the Over/Under market, look to go OVER 175.5 at odds of 1.90. Bet Now!